Any type of swelling that occurs in the face, especially around the eyes or the hands can be cause for concern in pregnancy. While it is very normal to experience swelling in the feet, the rest of the body is a different story. Certainly there are going to be weeks where you gain more than other weeks, but in general, the weight gain in pregnancy is slow and steady. If you find that you have a rapid increase in weight, with no explanation, you will want to contact your doctor or midwife right away. Certainly, some pregnant people have headaches in pregnancy, some more frequently than others. But if you have a headache that does not respond to treatment, including medications, call your provider for more advice. If you see stars or spots in your field of vision in pregnancy, it is time to call someone. Sometimes it’s hard to tell if you really saw the spots or not. The loss of vision is certainly something that may be easier to tell is happening. Either way, it’s an important symptom that should not be overlooked. This is not your typical morning sickness feeling, which sometimes may come back towards the end of pregnancy. For most pregnant people, this happens really rapidly. Not sure which it is for you? Call and ask the nurse or assistant in your practice for advice. This is not something that you can usually blame on much else. It’s pretty obviously not heartburn, and can’t really be where the baby is kicking you. You know the drill: Call your practitioner. This can include gasping, being short of breath, etc. This can be a very frightening symptom. Be careful not to assign it to something like being out of shape or blame it on the belly. These seven symptoms are important to know. When in doubt, talk it out – call your practitioner. You don’t have to have all seven of them, in fact, some women will have no symptoms of preeclampsia. This is why your prenatal care is so important. Every visit, your midwife or doctor will screen you for these symptoms, and others. 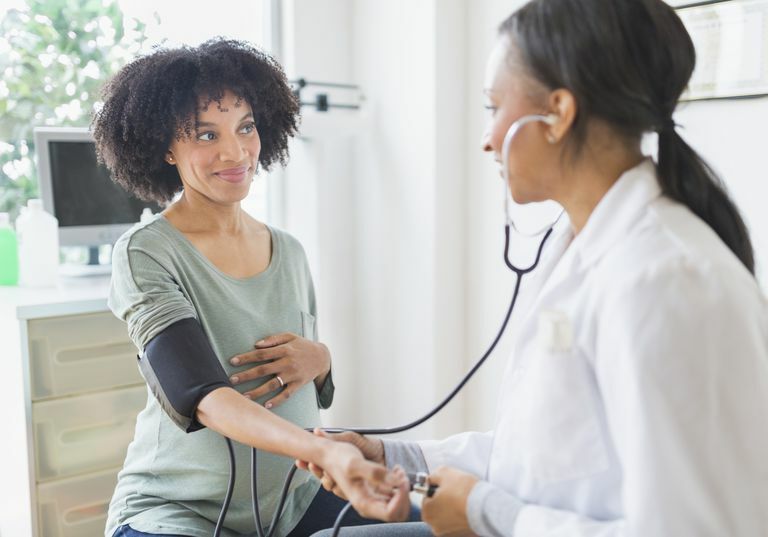 Two things that they will do at every prenatal visit are to check your blood pressure and to check your urine for protein. These two symptoms are ones that are not easy for you to screen at home. Most women will see a slight decline in their blood pressure over most of the pregnancy. Often there can be a return to baseline at full term. There is a specific cut-off for blood pressure that is considered elevated. Greater than 140 systolic blood pressure and/or greater than 90 diastolic blood pressure, regardless of baseline blood pressures. If you are diagnosed with preeclampsia, you and your baby will be monitored more closely. Typically you will have your baby early through a medically indicated induction of labor. When this happens, will depend on your length of gestation and your symptoms. The goal is to keep you pregnant as long as safely possible. Though it is possible that you will have an induction prior to term if your symptoms warrant it. Preeclampsia can lead to eclampsia, stroke, seizures, and the death of the mother and/or the baby. This is a very serious illness. In fact, we now know that there can be long term health consequences for the mother. It is a long term risk factor for stroke, thyroid disease, the development of diabetes, and heart disease. So be sure to tell all of your care providers that you had preeclampsia, even if it was mild and didn’t have a traumatic outcome. Signs & Symptoms. Preeclampsia Foundation. http://www.preeclampsia.org/health-information/sign-symptoms Last Accessed May 3, 2016.